PREMIUM QUALITY: Premium hand crafted wood handle with best quality stainless steel stick to attach replaceable blades. Built to last. METICULOUS CRAFTSMANSHIP: Beautifully designed to hold the lame firmly in place with a comfortable handle to achieve outstanding scoring results. REPLACEABLE BLADES: Blades are easily replaceable with standard razor blades (6 included). SAFE STORAGE: Includes hand-made, authentic protective leather cover to safely store away when done using. 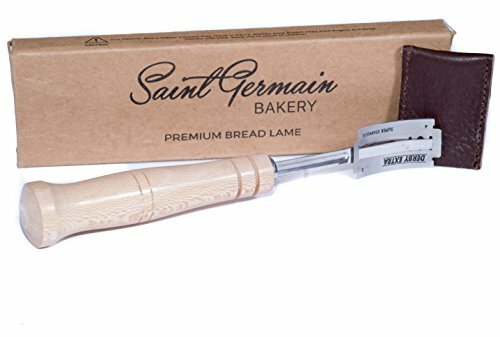 TOP PERFORMANCE GUARANTEE: We guarantee the bread lame will perform exceedingly well and enable you to bake beautiful breads. If you feel it fell short of your expectation, simply return it for a FULL REFUND.